The Saddle Ridge Hoard is the name given to identify a treasure trove of 1,427 gold coins unearthed in the Gold Country of the Sierra Nevada, California in 2013. The face value of the coins totaled $27,980, but was assessed to be worth $10 million. In total, the hoard contains $27,460 in twenty-dollar coins, $500 in ten-dollar coins, and $20 in five-dollar coins, all dating from 1847 to 1894. The collection is the largest known discovery of buried gold coins that has ever been recovered in the US. The Saddle Ridge Hoard was discovered in February 2013 on private property located in California Gold Country. Due to privacy concerns, the exact location of the discovery has not been disclosed, other than to confirm that the land is located in a hillside area of Gold Country, near the site of the Gold Rush of 1849. As of 2014[update], the couple who discovered the hoard have chosen to remain anonymous. Known only as John and Mary, the couple have lived on the rural property for several years and have no idea who buried the coins. They wish to keep their identity, location, and ownership history of their home private, in order to keep treasure seekers from trespassing on their property in an effort to find more gold. The owners of the property discovered the trove while they were walking their dog on their property. Although they had reportedly hiked the trail numerous times previously, it was not until they spotted a rust-covered metal can poking out of the ground that they chose to explore further. Before finding the trove, the couple had noticed some unique features of the area. They recalled seeing an old empty can hanging from an old tree. The can had evidently been there so long that the tree had literally grown around it. At the time, the couple surmised that the hanging can had possibly been used to hold flowers and mark a grave. They also noticed an oddly shaped rock on the nearby hill, which they nicknamed "Saddle Ridge". After they found the gold, they realized that the geographical features and the hanging can were probably markers to the site, placed by the original owners. The center of the treasure trove was located ten steps between the jagged rock and the direction of the North Star. After Mary noticed the can, John bent down to pick it up, but found that it was stuck in the dirt. He began to use a piece of wood to pry it from the ground. It was so heavy that they believed that the can likely held lead paint. On their walk back to their house, struggling to carry the weight of the find, the lid of the can cracked open, revealing the edge of a single gold coin. They returned to the site with some hand tools to see if they could find anything else. They found another can about a foot away from where the first can was discovered. Although it was partially decomposed due to rust, it held several more coins. They continued to return to the site to look for more coins, primarily digging in the ground and eventually using a metal detector. Their work eventually resulted in the discovery of eight cans filled with 1,427 coins. After their discovery, the couple protected their find by hiding it in an old ice chest, then burying it under a pile of wood and concealing the location. After some initial research, they contacted the numismatics firm of Kagin's in Tiburon, California, who is representing the owners. Numismatist David J. McCarthy of the California firm Kagin's completed the initial evaluation of the coins and assessed the significance of the find. Prior to the discovery of the hoard, the largest buried collection of gold found in the US was uncovered by city workers in Jackson, Tennessee, in 1985. The Jackson hoard had a face value of $4,500 and sold for about $1 million (not adjusted for inflation). The face value of the Saddle Ridge treasure is $27,980. According to Donald Kagin, Kagin's has an exclusive arrangement with Amazon.com to sell the coins through their collectibles store. This arrangement is the first major sale of coins made through Amazon. John and Mary have also chosen to use the funds to cover their personal debt and donate to several local charities. They have additionally chosen to retain some of the coins for family heirlooms and keepsakes. Following the initial discovery of the coins, there was widespread speculation that the hoard represented the discovery of the 1901 theft of $30,000 from the San Francisco Mint by employee Walter Dimmick. Kagin's and the U.S. Mint ruled out this theory, stating that the Saddle Ridge Hoard is unlikely to be part of the mint heist, due to the diversity in the face value and condition of the coins. On March 4, 2014, The U.S. Mint stated that "[they] do not have any information linking the Saddle Ridge Hoard coins to any thefts at any United States Mint facility", and "[they've] done quite a bit of research, and we've got a crack team of lawyers, and trust me, if this was U.S. government property we'd be going after it." Other disregarded theories contend that the hoard is a hidden stash of gold buried by Jesse James, or loot taken by Black Bart, who was known for robbing stagecoaches. A theory has also been advanced that the hoard was part of a treasure supposedly hidden by the Knights of the Golden Circle, to be used to fund a second Civil War. The predominant theory attributes the cache to an unknown individual who chose to bury the coins rather than trust the banks to protect his wealth. While the couple who found the coins have remained anonymous and the location of the find is undisclosed, several individuals have attempted to claim the gold coins or a share of the profits, asserting that the money belonged to one of their relatives or associates. ^ Kevin Fagan, San Francisco Chronicle (February 26, 2014). 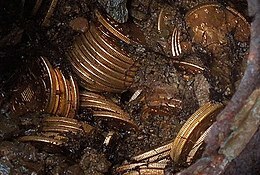 "Gold Country couple discovers $10 million in buried coins". SFGate. Retrieved February 26, 2014. ^ Kashmira Gander (February 26, 2014). "Couple finds $10million in gold coins while walking their dog - Americas - World". London: The Independent. Retrieved February 26, 2014. ^ a b c John Rogers. "California couple uncover rare gold coins worth $10 million while walking their dog". Prince George Citizen. Archived from the original on March 3, 2014. Retrieved February 26, 2014. ^ a b c d "Calif. couple strike $10 million gold-coin bonanza". The Washington Post. February 26, 2014. Archived from the original on February 26, 2014. Retrieved February 26, 2014. ^ a b c "PCGS Certifies $10+ Million Gold Coins Treasure For Kagin's Inc". Pcgs.com. Retrieved February 26, 2014. ^ a b c d "Interview". Saddle Ridge Hoard. Retrieved February 26, 2014. ^ "Buried Treasure of 1427 US Gold Coins Certified by PCGS For Kagins Inc". www.coinweek.com. February 25, 2014. Retrieved March 17, 2014. ^ Schaefer, Samantha; Vives, Ruben (February 26, 2014). "'Miraculous coin' in gold country cache could bring $1 million". www.latimes.com. Retrieved March 17, 2014. ^ Liljas, Per (February 25, 2014). "Couple Finds $10 Million in Gold Coins | TIME.com". Nation.time.com. Retrieved February 26, 2014. ^ "Bunch of bullion: Dealer says gold coin hoard not from heist". Cnbc.com. Retrieved March 6, 2014. ^ "$10 Million Mystery: Was Walter Dimmick the Gold Coin Fall Guy?". Mashable. Retrieved June 24, 2014. ^ a b "Could century-old theft explain mystery of gold coins?". CNN.com. February 26, 2014. Retrieved March 6, 2014. ^ a b John Rogers (Associated Press) (March 2, 2014). "California Gold Discovery Spurs Rush of Theories - ABC News". Abcnews.go.com. Retrieved March 6, 2014. ^ a b Kevin Fagan (February 28, 2014). "Black Bart? Jesse James? Who hid $10 million worth of gold?". SFGate. Retrieved March 6, 2014. ^ Schaefer, Samantha (March 4, 2014). "Gold coins found by California couple unlikely stolen from U.S. Mint". www.latimes.com. Retrieved March 17, 2014. 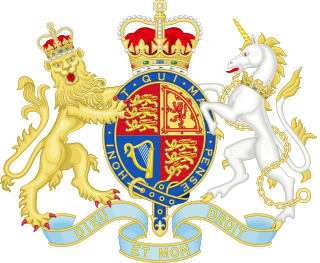 The Treasure Act 1996 is a UK Act of Parliament, defining which objects are classified as treasure, legally obliging the finder to report their find. The Cuerdale Hoard is a hoard of more than 8,600 items, including silver coins, English and Carolingian jewellery, hacksilver and ingots. It was discovered on 15 May 1840 on the southern bank of a bend of the River Ribble, in an area called Cuerdale near Preston, Lancashire, England. The Cuerdale Hoard is one of the largest Viking silver hoards ever found, four times larger than its nearest rival in Britain or Ireland, according to Richard Hall. In weight and number of pieces, it is second only to the Spillings Hoard found on Gotland, Sweden. The Hoxne Hoard is the largest hoard of late Roman silver and gold discovered in Britain, and the largest collection of gold and silver coins of the fourth and fifth centuries found anywhere within the Roman Empire. It was found by Eric Lawes, a metal detectorist in the village of Hoxne in Suffolk, England in 1992. The hoard consists of 14,865 Roman gold, silver, and bronze coins and approximately 200 items of silver tableware and gold jewellery. The objects are now in the British Museum in London, where the most important pieces and a selection of the rest are on permanent display. In 1993, the Treasure Valuation Committee valued the hoard at £1.75 million. The Vale of York Hoard, also known as the Harrogate Hoard and the Vale of York Viking Hoard, is a 10th-century Viking hoard of 617 silver coins and 65 other items. It was found undisturbed in 2007 near the town of Harrogate in North Yorkshire, England. The hoard was the largest Viking one discovered in Britain since 1840, when the Cuerdale hoard was found in Lancashire, though the Anglo-Saxon Staffordshire Hoard, found in 2009, is larger. The Broighter Gold or more correctly, the Broighter Hoard, is a hoard of gold artefacts from the Iron Age of the 1st century BC that were found in 1896 by Tom Nicholl and James Morrow on farmland near Limavady, in the north of Ireland. The hoard includes a 7-inch-long (18 cm) gold boat, a gold torc and bowl and some other jewellery. A design from the hoard has been used as an image on the 1996 issue of the Northern Ireland British one-pound coins and the gold ship featured in a design on the last Irish commemorative one-pound coins. The Broighter Collar and Broighter Ship also featured on definitive postage stamps of Ireland from 1990–1995. The National Museum of Ireland, who now hold the hoard, describe the torc as the "finest example of Irish La Tène goldworking". Replicas of the collection are kept at the Ulster Museum in Belfast. The Stirling torcs make up a hoard of four gold Iron Age torcs, a type of necklace, all of which date to between 300 and 100 BC and which were buried deliberately at some point in antiquity. They were found by a metal detectorist in a field near Blair Drummond, Stirlingshire, Scotland on 28 September 2009. The hoard has been described as the most significant discovery of Iron Age metalwork in Scotland and is said to be of international significance. The torcs were valued at £462,000, and after a public appeal were acquired for the National Museums of Scotland in March 2011. The Wickham Market Hoard is a hoard of 840 Iron Age gold staters found in a field at Dallinghoo near Wickham Market, Suffolk, England in March 2008 by car mechanic, Michael Dark using a metal detector. After excavation of the site, a total of 825 coins were found, and by the time the hoard was declared treasure trove, 840 coins had been discovered. The coins date from 40 BC to 15 AD. There are two notable Ipswich Hoards. The first was a hoard of Anglo-Saxon coins discovered in 1863. The second was a hoard of six Iron Age gold torcs that was discovered in 1968 and 1969. The latter hoard has been described as second only to the Snettisham Hoard in importance as a hoard from the Iron Age, and is held at the British Museum. The St Albans Hoard is a large hoard of late Roman gold coins found by a metal detectorist in a field near St Albans, Hertfordshire, England in 2012. It is believed to be one of the largest hoards of Roman gold coins ever found in Britain. The hoard consists of 159 solidi dating from the last decades of the fourth century AD, near the end of the Roman occupation of Britain. After about 408, new Roman coins ceased to circulate in Britain, causing the collapse of the monetary economy and of mass-production industry. The Bitterley Hoard is the largest post medieval / English Civil War Coin Hoard found to date from Shropshire, England. It was discovered on 17 February 2011 by a metal detector user near the village of Bitterley, South Shropshire. The find consists of one gold coin and 137 high denomination silver coins. These were placed within a high quality leather purse which was contained within a pottery vessel called a tyg. The earliest coin was from the reign of Edward VI, the latest from the Bristol Provincial Mint of Charles I, indicating it was buried after early 1644.